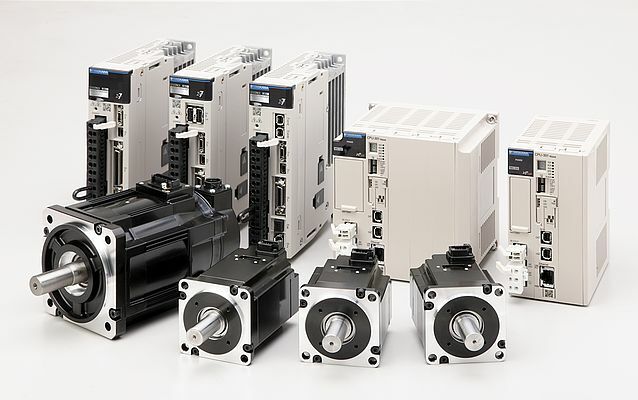 Fast commissioning, high production output and maximum operational reliability are key goals of Yaskawa's latest range of Sigma-7 Servo Drives The compact Sigma-7 servos (200 V Series & 400 V Series) cover a wide power range from 50W up to 15kW in various formats with large motors offering a continuous torque of 95Nm and a peak 224Nm. They represent a powerful response to the demands of today’s production engineering machine builders and end-users in packaging plants, semi-conductor manufacturing, digital printing and wood processing. The Servo Drives are available with embedded EtherCAT and Mechatrolink3 communications with further connectivity options to follow. The Sigma-7 Servo is the latest example of this capability as demonstrated by some important features and benefits. For example, quick set-up in just 3 minutes thanks to pre-sets in the amplifier software to simplify commissioning, a ‘tuning less’ function enabling immediate use without the need for complex parametrisation or special knowledge of control equipment, along with an auto-tuning function to ensure quick adjustment. The drives also meet the demands to save space without compromising performance as their ‘book-style’ housing design supports side-by-side installation of amplifiers. This means they can operate in small spaces to enable high density performance inside smaller cabinets allowing for both drive and control electronics to be integrated in the machine. Sigma-7 drives are also designed to help end-users achieve lower production costs, with features such as speed loop bandwidth of 3.1kHz, shorter settling time, reduced positioning time resulting in higher throughput. Sigma-7 drives are designed for maximum accuracy and precision courtesy of a 24-bit absolute encoder ensuring a resolution of 16 million pulses per revolution for extremely precise positioning. This is combined with a fast, smooth operation with features such as ripple compensation to meet the highest demands for smoothness and dynamics, even for applications where speed loop gains cannot be set high.